The past three days were gorgeous, like a return to spring, so my mind naturally returned to the garden — which I confess I had left pretty much to its own devices the past several weeks. 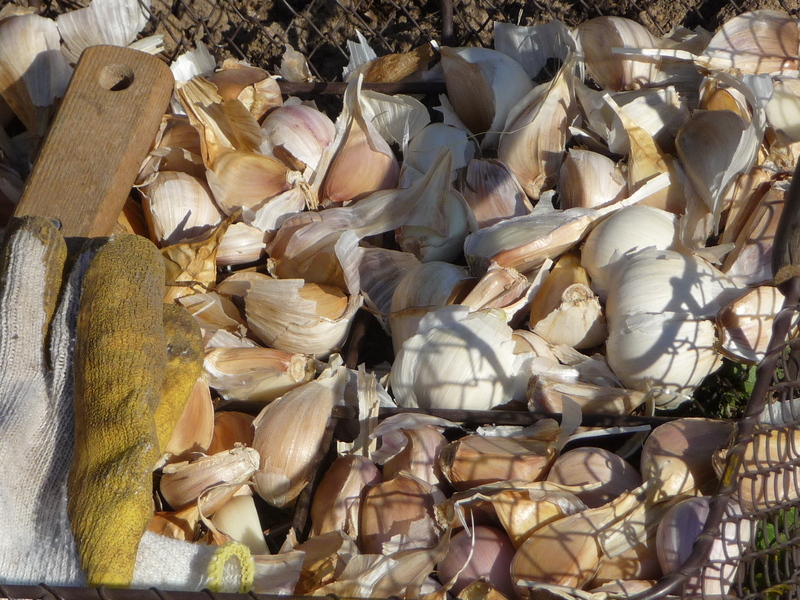 I had planned to plant hardneck garlic this year as usual, but had left it kinda late. Came the hurricane, and chill weather, and a feeling that I had missed the horticultural boat. Then Gary, spurred on by the brief Indian summer, foolishly sweetly asked what he could do to help. Over morning coffee, I gave him the chore of prepping two small beds, figuring he would forget it during a day of brushing goose blinds. Wrong. He went out immediately with a garden fork, looking a little like a man marching into battle, and not only weeded and dug and fluffed the beds, he also spread two loads of compost over them, which meant I really had to follow through that day instead of sitting in a garden chair with a beer and book and a blissful expression on my face enjoying the last balmy days of the year. So I did. Get up off my duff, that is. Garlic is the Rodney Dangerfield of the larder. It gets no respect. Even sophisticated cooks settle for those aging white knobs in the supermarket, most of which come all the way from China, which is the world’s largest garlic producer last time I checked. 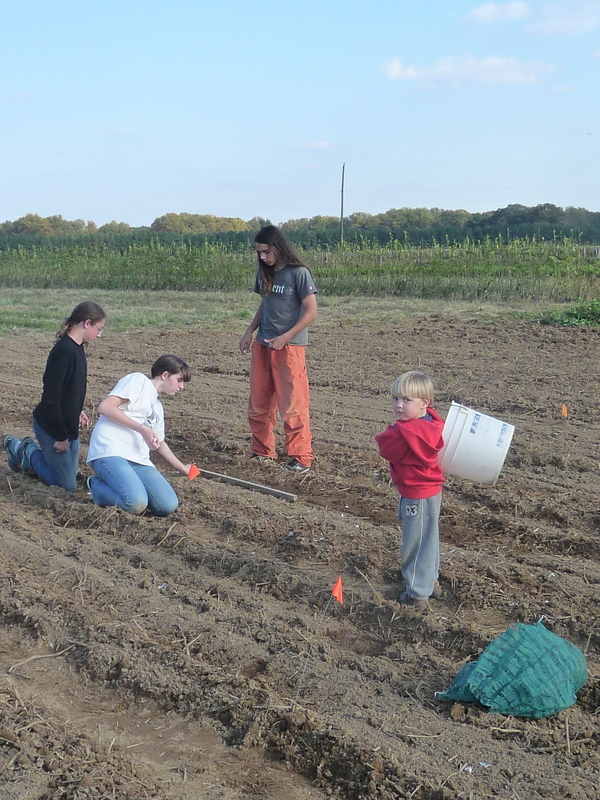 But most of us settle because we haven’t experienced the locally grown difference. I hadn’t until a few years ago when I tasted Music hardneck garlic, a large-cloved Italian variety with a sweet pungent flavor named for Al Music who brought it to Canada in the 1980’s. Compared to the store-bought stuff I’d been using for years, it made me feel as though I’d been cooking with oven mitts over my taste buds. Crisp and juicy, it brightened everything – aioli, pesto, chicken cacciatore, pepper hummus, Moroccan beef, and 10-minute pasta. (Throw together in a bowl: torn brie cheese, chopped fresh tomatoes, fresh basil, and mashed garlic. Add salt, pepper and a splash of olive oil. Cook linguine then dump the hot drained pasta over the raw sauce and mix. Supper’s ready. Don’t forget the red wine.). Softeneck garlic varieties grow a bulb that’s a clustered clump of cloves, while hardneck garlic has five to seven cloves in a single ring around a hard center stem. Hardneck types also produce a late spring scape, an elegant edible green curly-cue at the top of the stem, so hardneck’s a kind of two-fer culinarly-speaking. Softneck garlic, which has no center stem (hence no scape) usually stores better and some say they’re easier to grow, but hardnecks, which store up to six months in a cool, dry place, have better flavor in my estimation. 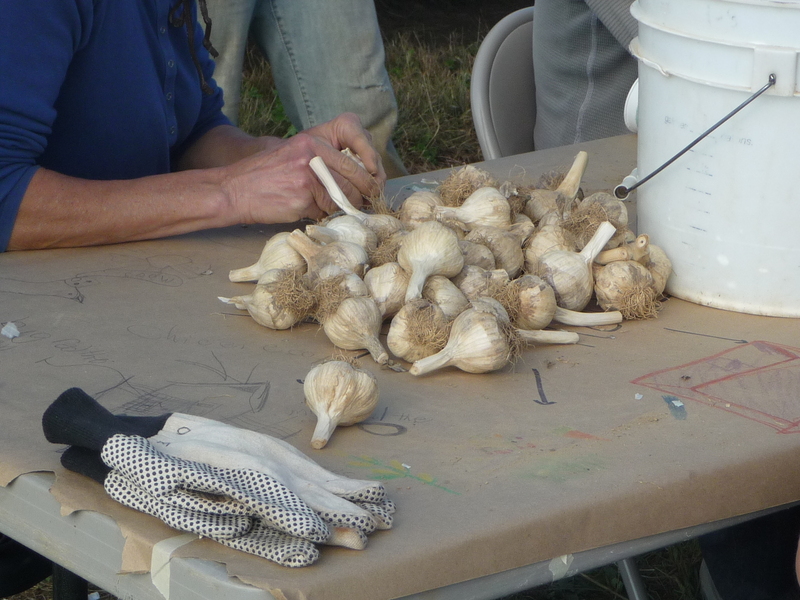 Planting garlic is simple. (And once you’ve grown it, you can save some and plant your own for next year’s crop.). Each planted clove produces a new bulb. It needs well-drained soil and will rot (as mine did one year) if you plant it in too-wet ground without enough steady sun to dry it sufficiently, or if you mulch it too heavily and leave heavy sodden mulch on during a damp spring. Having said all that, it’s actually easy to grow. 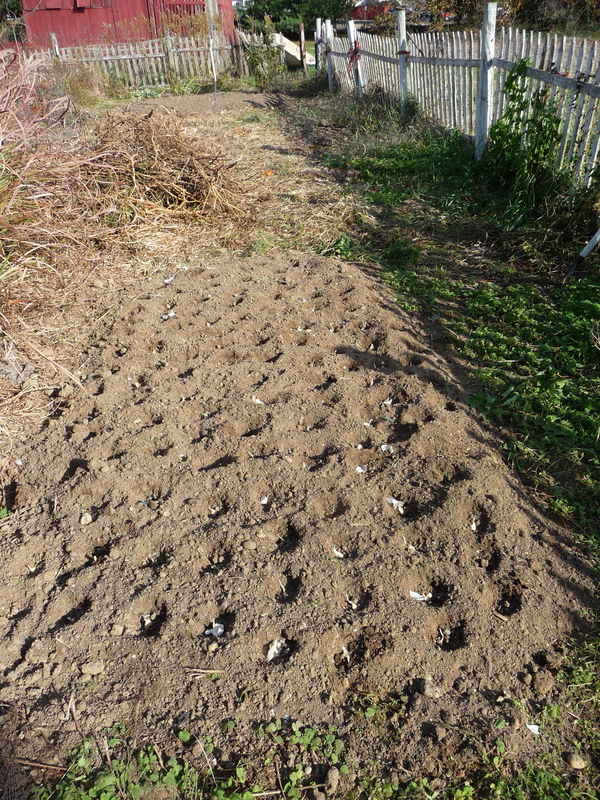 The two beds Gary prepped are both new to garlic in our garden and are fairly well-drained so we have high hopes. Break the bulbs apart into cloves, being sure to leave the plate (the flat foot of each clove) intact; it’s where the coming season’s roots will emerge. Push each clove down into loamy earth on a dry day (like yesterday — it was lovely, warm breeze, sunshine, gorgeously prepped bed I could get my fingers into easily) about 6-8 inches apart. I plant mine in a grid and will mulch them lightly with fresh straw once I get hold of some in the next few days.